One Being is the Source of all creatures. Behind your individuality, beneath your cultural images of self, that Being is who you are. We bring you these transmissions that you might come to live once again as we do, in full consciousness of your Source… When you know yourself this way, you recognize the others of your kind. You awaken to awareness of our common Source… Though not all of us have chosen, as you have, to dress in human form, still, we are your family within time, your sisters, your bothers. Beyond time, we are One. We are a race of voyagers, spirit beings in the eternal fields of light; yet we are you yourselves as you would have been had you not succumbed to the spell of matter. We are you as you remain beyond material illusion, addressing in these pages a sleeping part of ourselves that you might awaken and know this awareness as your own. To be the One and simultaneously the many–this is your calling, your purpose, the ultimate destiny of your kind. You are the template, the prototype of a new and universal species, part solar, part material, both temporal and eternal, the species that will span the gulf between the visible and invisible… Through you a new and unprecedented cycle of creation will occur. Echoes of this awareness have ever haunted the historical continuum, surfacing here and there in your better music, glimmering occasionally in your finest art. But when you entertain the open and unbiased vision of eternity, even the best of what has been, the finest moments of the human past, [pale in comparison] to the future that is soon to be. Evidence assembled in recent years has led several groups of astronomers to renew the search for the 10th planet. They are devoting more time to visual observations with the 200-inch telescope at Mount Palomar in California. They are tracking two Pioneer spacecraft, now approaching the orbit of distant Pluto, to see if variations in their trajectories provide clues to the source of the mysterious force. And they are hoping that a satellite-borne telescope launched last week will detect heat ”signatures” from the planet, or whatever it is out there. The Infrared Astronomical Satellite was boosted into a 560-milehigh polar orbit Tuesday night from Vandenberg Air Force Base, Calif. It represents an $80-million venture by the United States, Britain and the Netherlands. In the next six or seven months, the telescope is expected to conduct a wide-ranging survey of nearly all the sky, detecting sources not of ordinary light but of infrared radiation, which is invisible to the human eye and largely absorbed by the atmosphere. Scientists thus hope that the new telescope will chart thousands of infrared-emitting objects that have gone undetected – stars, interstellar clouds, asteroids and, with any luck, the object that pulls at Uranus and Neptune. Recent calculations by the United States Naval Observatory have confirmed the orbital perturbation exhibited by Uranus and Neptune, which Dr. Thomas C. Van Flandern, an astronomer at the observatory, says could be explained by ”a single undiscovered planet.” He and a colleague, Dr. Robert Harrington, calculate that the 10th planet should be two to five times more massive than Earth and have a highly elliptical orbit that takes it some 5 billion miles beyond that of Pluto – hardly next-door but still within the gravitational influence of the Sun. At a scientific meeting last summer, 10th-planet partisans tended to prevail. Alternative explanations for the outer-planet perturbations were offered. The something out there, some scientists said, might be an unseen black hole or neutron star passing through the Sun’s vicinity. Defenders of the 10th planet parried the suggestions. Material falling into the gravitational field of a black hole, the remains of a very massive star after its complete gravitational collapse, should give off detectable X-rays, they noted; no X-rays have been detected. A neutron star, a less massive star that has collapsed to a highly dense state, should affect the courses of comets, they said; yet no such changes have been observed. More credence was given to the hypothesis that a ”brown dwarf” star accounts for the mysterious force. This is the informal name astronomers give to celestial bodies that were not massive enough for their thermonuclear furnaces to ignite; perhaps like the huge planet Jupiter, they just missed being self-illuminating stars. Whatever the mysterious force, be it a brown dwarf or a large planet, Dr. Anderson said he was ”quite optimistic” that the infrared telescope might find it and that the Pioneer spacecraft could supply an estimate of the object’s mass. Of course, no one can be sure that even this discovery would define the outermost boundary of the solar system. 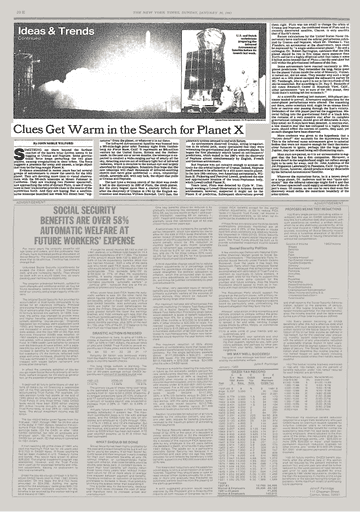 A version of this article appears in print on January 30, 1983, on Page 4004020 of the National edition with the headline: IDEAS AND TRENDS; CLUES GET WARM IN THE SEARCH FOR PLANET X. Just revisiting this topic of the subterranean Earth (i.e. Hallow Earth, Middle Earth, Inner Earth…) Because of the science (physics, astrophysics, geology, oceanography…), the photographic evidence (not just of Earth but the other planets in our solar system), the publications, ancient accounts, native accounts, Tibetan accounts, modern accounts by Western explorers, detailed maps, and no-fly-zones over the poles, etc., it seems the Hallow Earth theory is far more plausible than that of Flat Earth. You can’t have both. You can’t have the existence of the famous Middle Earth cities of Agharta, Shambhala, Potala, Telos, etc. in a Flat Earth. The data alone follows the higher science of torsion energy. Anyway, this video does a great job in arguing its case for the Hallow Earth.